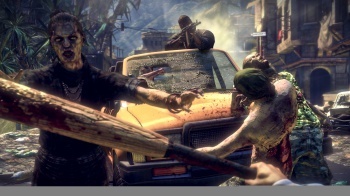 The latest DLC pack for Dead Island will deliver a new playable character, among other things. If Emily Dickinson is correct, then the dead have no conception of time. This is fortunate for the zombies of Dead Island, who have been slavering and chomping without anything new to kill since the game's much-delayed DLC pack in November. For impatient zombies and hunters alike, the wait for more content is just about over. On February 1, 2012, players can step into the shoes of an antagonist when the Ryder White pack will go live on XBLA, PSN, and Steam. The DLC will offer a new take on the existing Dead Island story, allowing players to take control of the villainous Ryder White. Survivors of the original game may remember White as the madman who decided the best way to fix Banoi's zombie problem was to invoke the nuclear option. Players who aren't especially interested in White's story will be pleased to know that the package also includes two new blueprints and weapons for any and all zombie-smashing needs. Dead Island has had some zombie-like stumbles since its launch. It's had its share of bugs, skirted controversy, and seen its DLC delayed. In spite of all that, the developers have kept the game afloat through regular patches and new content. Ryder White will set British zombie hunters back 800 MS points or Â£7.99, with similar prices in the rest of Europe and North America.